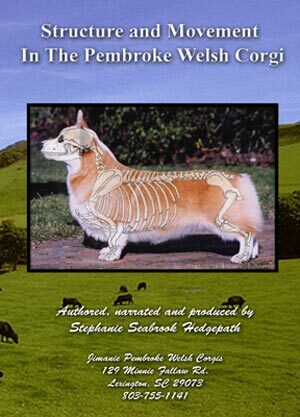 "Structure and Movement in the Pembroke Welsh Corgi"
This video will teach you how to "see" structure and how to "feel" structure and instructs you on how to learn to see and understand movement. A MUST FOR THE LIBRARY OF ANYONE WHO BREEDS OR SHOWS PEMBROKES. The highest praise has been received on this DVD from all corners of the world. Pat Sandy-Smith (Sandyshire) started in the breed in the breed in 1959. I was thrilled beyond words when Pat told me, "I learned more about this breed in two hours than I had in the prior 50 years I've been in the breed." Order now! $50.00 plus $2.50 for ground shipping, priority shipping is $4.95 (both continental US - Contact Jim for shipping costs out of the continental US). Pay via PayPal or call 803-755-1141 (9 am to 5 pm Eastern time M-F) if you wish to order using a credit card. If ordering from outside of the continental US, please order via this link to Strictly Animals.